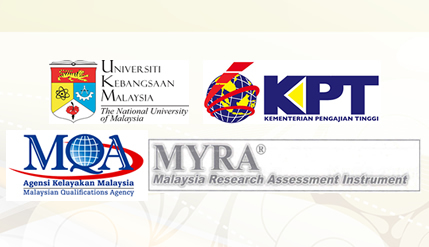 BANGI, 2 Nov, 2012 – The National University of Malaysia (UKM) received a 6-star rating by Malaysian Research Assessment Instrument (MyRA) for its research, development and commercialisation efforts. At the same time, UKM received the Malaysian Qualifications Agency’s (MQA) Tier-5 or Excellent rating under SETARA ’11 for its quality of teaching and learning at undergraduate level. The Minister of Higher Education, Datuk Seri Khaled Nordin made the announcement yesterday. Three other research universities, Universiti Malaya, Universiti Putra Malaysia and Universiti Sains Malaysia, also received 6 star rating under MyRA. The other research university, Universiti teknologi Malaysia received a 5-stae rating. UKM is among 35 universities to receive Tier-5 status or excellent under the SETARA ’11. Thirteen public universities were rated this status while the rest were private sector universities. All five research universities in Malaysia received this rating. No universities received the highest rating of Tier-6 or Outstanding. Sixteen institutions were classified on Tier-4 (very good), while one university was rated as Tier-3 or Good. There were no universities or university colleges classified under Tier-2 and Tier-1. For more information on SETARA ’11 rating, please click at http://www.mqa.gov.my/SETARA11.